"I think it's clear the Russians are trying to cover up what happened there," said one senior White House official, who described an active "cover-up" by Russia meant to obfuscate "Syrian regime culpability" in the attack. "The cover up is the disinformation since the day of the attack," the official said, declining to comment further on whether Russia had direct knowledge of the attack before it took place. "We do think it is a question worth asking the Russians: How is it possible their forces were collocated with the Syrian forces that planned and carried out a chemical weapons attack at the same installation and did not have foreknowledge," said one of the senior White House officials who brief reporters. "We do not asses and have not assessed that any terrorists or ISIS in the area have sarin," said one of the senior U.S. officials. "It is quite clear to us this is not a terrorist holding of sarin or use of sarin. But we do know the Syrian regime has sarin and used it in the 2013 attack." The Syrian regime "has not fully come clean" about the locations, facilities, agents, and personnel sponsoring the chemical weapons program. 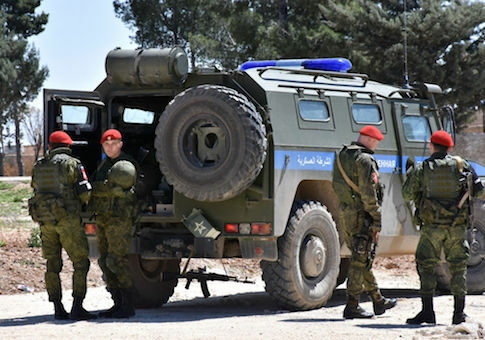 "It’s a clear pattern of deflecting blame," the official said, referring to Russia's efforts to defend Assad and push a false narrative about the attack. U.S. intelligence officials have confirmed that the chemical attack was carried out by "regime controlled" aircraft, which spent about 20 minutes dropping the chemical weapons. "We have information that suggests that [Syrian] personnel historically associated with the chemical weapons program" were at Shayrat airbase in late March and again present at that airfield during attack. The United States also has obtained physical samples from victims that are "consistent with nerve agent and sarin exposure," according to the official. This entry was posted in National Security and tagged Bashar al-Assad, Chemical Weapons, Russia, Syria. Bookmark the permalink.